The first is the addition of relevance ranking in your Docs list search results. Until now, anytime you searched for a document, the results were sorted by "last modified date". Now, your search results will display the items most relevant to your search at the top of the list. We also added a new menu on the right side of the toolbar, which lets you decide whether you'd like to sort your Docs list by "Relevance," "Starred" or "Last Modified". This improvement to search within Docs also includes automatic stemming and synonyms. So if you search for "check account", we'll also include results for a few variations of those words, including "checking account" (which is what you probably meant to type). Or if you search for "mac book", we'll also include results for "macbook". There's also more good news from the Data Liberation Front. A few weeks ago we launched the new "Export..." functionality. Today, we added an "Export all" option, which lets you export all your docs (up to 2GB at a time) with one click. This is the equivalent of almost 100,000 Google Docs. You can also export a single file and email it to anyone you'd like in a single step. Once you select an item, click "Share" and select "Email as attachment...". Then pick which format (PDF, MS Office, etc.) you want to use to send the item, compose your email, and hit send. Lastly, a change that we aren't excited about. We're removing the existing "email-in" feature. As you may know, it's been a bit buggy recently and only supports a small subset of document types compared to the Docs list. In order to address this, we'll be taking down the feature and working on a bringing it back in the future with more functionality and better integration. 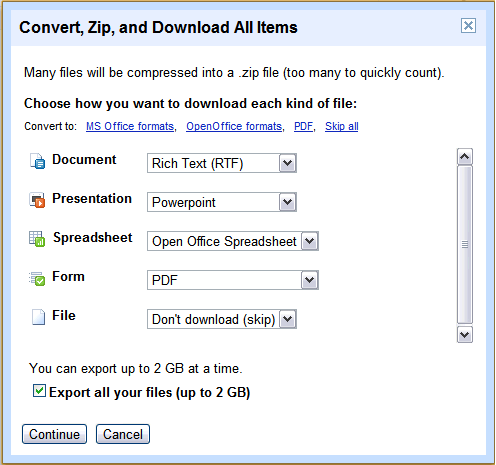 In the meantime, you can use the multi-file upload in your Docs list or the GData API to programatically upload docs. 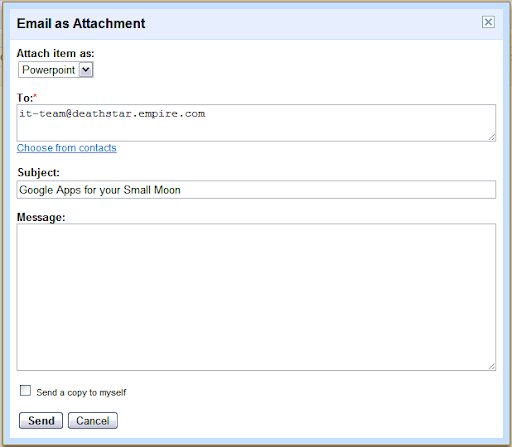 You can also take attachments from GMail and open them in Google Docs. If you have any questions, please let us know over on the forum. Over the next few days, we will be enabling several new features in your Docs list.